Pure Moroccan Argan oil for hair and cosmetics; reviews and benefits of the Argan oil. What is Argan oil or Moroccan oil as it is widely known? Lately, the talk about Argan oil is all over the place in the beauty circles, and like anything esle when it gets a lot of attention a lot of hype and misinformation follows that conversation. 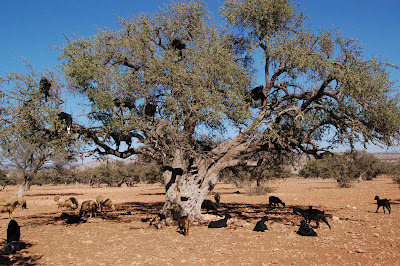 So, let’s 1st explain what is Argan oil and what is not? This is miracle tree as some like to call it has been around for thousands of years. At one time you could find it over a large swaths of land in the northwestern Africa, mainly the land of the Amazigh people, the original inhabitants of North Africa. But with the desertification, it only grows at the present time in the southwestern part of Morocco, thanks to its deep roots that fetch water way deep in the arid environment of the Moroccan dry climate, the tree can live for hundreds of years, and regrows even after it has been cut. use it, that the label says 100% organic Argan oil from Morocco. The color of the fruit when still on tree is light green , and the pits are amber color. The oil is rich in fatty acids and vitamin E . 80% of argan oil is made up of unsaturated fatty acids and is said to have both cholesterol lowering and rejuvenating properties. Treats all dry hair and skin types. And the list goes on and check our other articles about these benefits of Argan oil to get more details, and also get the information you need to use it the right way, and get the most out using Moroccan oil. 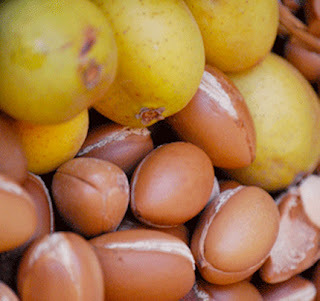 What argan oil is not: Argan is not a cure all miracle, and different skin type respond differently to the treatment. Although , there is no side effects to using it. Some types have a better outcome due to its composition, so aim for the pure Argan oil, and avoid the one mostly made in Israel ,as most of those are mixed with other oil and packaged as Argan oil… remember only Moroccan Argan is the real thing. And anything else is just imitation . Not only is Argan oil one of the most sought after ingredients and individual products in the beauty industry. But did you know that it can be used for more than just fighting wrinkles and heal scars? So, here is 10 things to know about Argan oil or this Moroccan miracle oil, as it is often called, contains 80% essential fatty acids (to reduce inflammation), and Squalene (to keep our skin soft), phytosterols (to protect collagen) and phenolic compounds (which protects against free radicals). This makes it A very versatile beauty product for those who want to keep their beauty routines simple and achieve maximum results naturally. Here are 10 reasons to use argan oil, other than to reduce lines and wrinkles. First: Argan Oil Softens dry, cracked skin. It contains high levels of unsaturated fatty acids, even more so than Shea butter, making it perfect to use for face, hair and body. 2nd: Argan oil helps prevent stretch marks effectively. The oil is absorbed by the skin very quickly and leaves no greasy surface a shiny healthy more youthful skin. 3rd: For regular use of lighter scars, argan oil can help lighten acne marks and scars, and helps the skin heal without the use of harsh chemicals with side effects. 4th: Balances sebum production and does not clog pores. 5th: Perfect if you have eczema and psoriasis and is one of the richest natural sources of vitamin E, and is a super good treatment for various skin conditions. 6th: Softens cuticles. Massage a few drops of Argan Oil onto your cuticles to soften and condition them. For best results leave on overnight . 7th: It provides great moisturizing abilities to the hair and is a great intense balancing which can also be used to help split ends , and manage dry hair. 8th : Relieve dry, itchy scalp. Apply to scalp and wrap your head in a warm towel for 30 minutes or overnight to soothe irritation and heal it. 9th: Calms irritated baby skin. A great alternative to chemical-based baby oils, and odor free. 10th: it is 100% organic and USDA and Eco certified. Plus , but using the Moroccan oil, you can feel good not only for making you look and feel better, but also knowing you are helping single women cooperatives in Africa that make this wonderful product. As you can see, argan oil serves a variety of purposes. Try raw, certified and organic argan oil by Moroccan women authentic cooperative under the label Atlas Argan oil.